What de Fudgee-o? Monster feel like he in Bizarro world where black be white, day be night, and superhero movies aktually be good! If X-Men was superhero movie made by people not embarrassed to be making a superhero movie, den Spiderman be superhero movie made by people who love superheroes – and comic books. It be a big, bright, beootiful love letter to comic book fans wit a sprinkling of humor, ladles of drama, generous cups of action, and dash of nutmeg. Dat one tasty love letter! 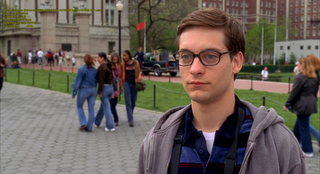 Movie begin wit nerdy Peter Parker who, on visit to genetic lab, get bitten by very spiteful experimental spider. He return home feeling like monster after dat time me mistakingly ate Bert’s “special happy” brownies. And den angry Bert break ceramic lamp over monster’s head. VERY woozy. 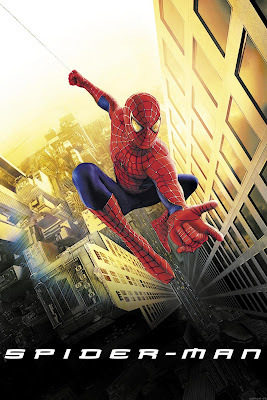 Next morning, Peter wake up wit muscles and special abilities like power of jumping, strength, agility, wall climbing, web shooting and, most important of all, power of costume design and sewing. Oh, and like all real life spiders, he possess spidey sense dat warn him of danger. Peter enter amateur wrestling match to earn $300 for new second hand car but promoter rip him off. He upset. So upset dat when robber steals from promoter, Peter doesn’t use his superpowers to stop him. Dis be very bad decision becuz robber den carjack and kill Peter’s uncle Ben. Peter realize “Wit great power come great responsibility (and chicks, but dat come later)” so he embark on life as crime fighter – and freelance newspaper photographer since he, coinsidentally, always able to snap great pictures of webhead. DIS de best costume dey could come up wit? Really? Meanwhile, Norman Osorne, father of Peter’s best friend, Mopey McBoring, under pressure from military, tests super chemikal on himself even tho his assistant warn him dat side effects on rats include violence, aggression and eventually insanity. Insanity? How exaktly to tell violent, aggressive insane rats from violent, aggressive sane ones? Monster not sure but, den again, me not rat expert. Anyway, yep, Norman go insane. He makes his own supervillain outfit, jump on experimental glider, and go on killing spree – first military officials who pressure him, den board of his company, Oscorp, when dey try to force him out. 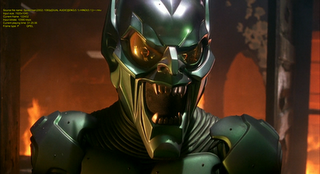 He get nickname…De Green Goblin! Spiderman and Green Goblin clash. Green Goblin want to be his friend but Spiderman say no. Apparently, he already have enuf friends. 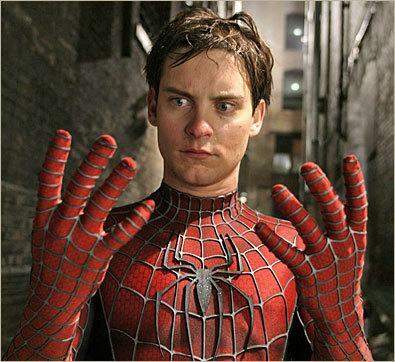 Green Goblin upset and, after finding out Spiderman is really Peter Parker, he put Aunt May in de hospital, den kidnap Peter’s secret crush, MJ. Big fight! Green Goblin unmask hisself, den get impaled by his own glider. To spare his best friend finding out his dad really Gren Goblin, Spiderman take Norman’s body back to de Osborne home and put him in bed, presoomably so people will assume he died of natural causes. ie. Natural stab wounds. Movie end wit MJ revealing she love Peter but Peter not want to put her in danger so he tell her he can only be her friend. Overall, monster like dis movie a lot. Great performances, especially by super-creepy Willem Dafoe and scene-stealing J.K. Simmons as J. Jonah Jameson. Kirsten Dunst less convincing as young MJ and monster never really buy her falling in love wit Peter at end. If she be type of girl dat go out wit a lunkhead like Flash Thompson in beginning of movie, den she NOT de type of girl to go out wit nerd like Peter Parker at end of movie. Visual effekts not bad but kind of dated. Most of de time, de CG look like footage from a video game. A very good video game, but still. Biggest disappointment for monster was bulky Green Goblin costume dat look sillier den Grover’s Slave Princess Leia outfit. Verdikt: Solid skript and movie. VFX a bit dated and Green Goblin costume super lame but overall dese small complaints.